This past weekend in Tokyo, Square Enix did their first location test of the upcoming Dissidia: Final Fantasy arcade—and Kotaku was on hand to try it out. To begin with, let’s look at the arcade cabinet itself. The game has what appears to be two joysticks. However, they aren’t joysticks as they are stationary and don’t move at all. Rather the joystick-like towers are more like a very thick PlayStation 4 controller that has been broken in half—with the left one containing a thumbstick and two trigger buttons while the right one contains all the normal PlayStation face buttons along with another thumbstick and two trigger buttons. Between the controller halves is a giant crystal-shaped button that can be used for summoning monsters. The screen is also a touch screen which allows for quick character customization before each battle. The location test was set up for three versus three combat and each player was allowed to play two rounds—with the first taking place in a field area outside Final Fantasy I’s Cornelia and the second in Final Fantasy VII’s Midgar. 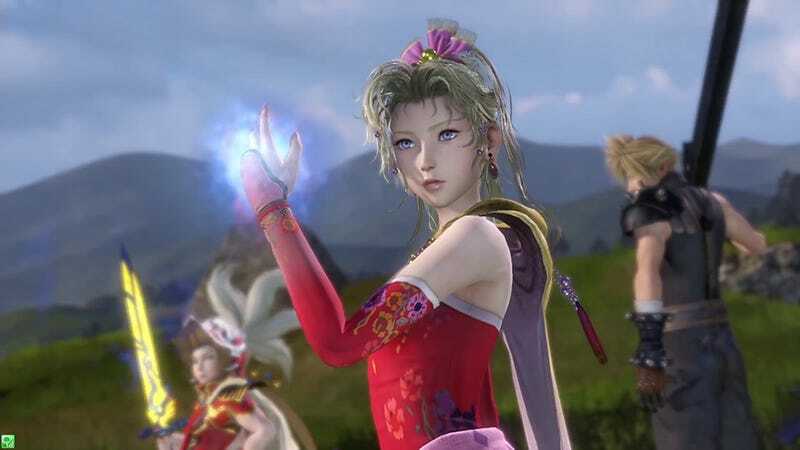 The demo had six characters to choose from: The Warrior of Light (Final Fantasy), The Onion Knight (Final Fantasy III), Terra (Final Fantasy VI), Cloud (Final Fantasy VII), Lightning (Final Fantasy XIII), and Y’shtola (Final Fantasy XIV). Before the battle starts, you are allowed to choose from different skill loadouts for your chosen character as well as send pre-made chat messages to the other two teammates in your party. In battle, the Dissidia: Final Fantasy arcade game plays a lot like its PSP cousins. Each character has two kinds of standard attacks: HP attacks (which do HP damage) and bravery attacks (which do no damage but increase the damage that HP attacks do). As you attack you also unlock EX skills—which are everything from super powerful attacks to buffs and healing for your whole party. Also as the battle goes on and you do damage to the opposing team, the crystal button glows—and by pushing and holding it—you can summon a creature (in the demo’s case, Ifrit). During the summoning, you are completely undefended; but if your teammates also summon at the same time, casting time is reduced. The summon itself is AI controlled and, in the case of Ifrit, rains down fire across the stage, setting it ablaze. The biggest difference between the Dissidia: Final Fantasy arcade game and the original games is also the most obvious: the three on three battles. In a lot of ways, Dissidia: Final Fantasy feels as much like the Gundam Extreme Versus games as it does Dissidia. Each team shares a segmented life bar. With each death on your team, a segment is lost. When a team’s bar is completely emptied, it’s game over for that team. For my time with the game, I played first as Terra and second as Cloud. I found them to play quite uniquely from one another with Terra having nothing but ranged magic attacks and Cloud using primarily powerful, but slow, close-range sword strikes. And with multiple enemies on the field, the game is much more chaotic; and double and triple teaming can happen if you’re not careful. While short, I enjoyed my time with Dissidia: Final Fantasy and look forward to spending some quality time with the full game when it is released in Japanese arcades later this year.